Indulge in playful yet elegant timekeeping, with this deep purple leather strap watch by British designer Radley. Crafted with a rich gold-plated stainless steel case, pale cream dial and finished with a cute Scottie dog charm. 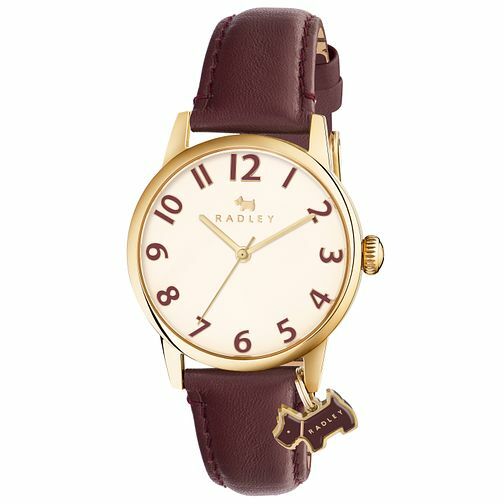 Radley Ladies' Cream Dial Purple Leather Strap Watch is rated 5.0 out of 5 by 5. Rated 5 out of 5 by Anonymous from Large Clear Face This was bought a present for my mother. It has has a nice sized faced and she will be able to clearly see the time. Hope she thinks the same! Rated 5 out of 5 by Anonymous from Nice large dial face Very pleased with the purchase ,easy and faultless .